By fulfilling its mission in the Catholic Church, the Society of Christ Fathers for Poles Living Abroad takes part in the apostolate of caring for the souls of Polish people who live outside the borders of Poland. 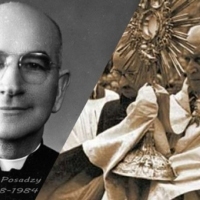 Spirituality of the Society of Christ Fathers, which follows from monastic and priestly life, is based on the charism of its founder - Servant of God Cardinal August Hlond - as well as the Society"s mission. It also rises out of subsequent traditions that have been built by the Society, especially under the leadership of its first superior general and co-founder - Servant of God Rev. Ignacy Posadzy. The broadly defined concern for Polish emigrants is not confined to performing pastoral duties only. In foreign provinces, apart from the pastoral work, great importance is also attached to the cultivation of the patriotic spirit, social life and the Polish culture. This goal is being pursued by means of any media available (radio broadcasts in Polish, parish brochures and catholic periodicals, websites etc.). Society of Christ Fathers for Poles Living Abroad (Latin: Societas Christi pro Emigrantibus Polonis), often abbreviated to SChr (Polish: TChr), is a monastic congregation established on the basis of the Code of Canon Law. It gathers priests and brothers with simple vows taken (initially, members take temporary vows and then perpetual vows of chastity, poverty and obedience).